Hola Greyhawkers! This week is GenCon and like many of you, I am not there. Boo! So while Greyhawk is certainly being played by the masses I have some new maps to show those who haven't already seen them. 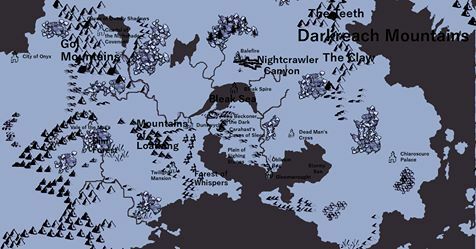 Over at old school fansite The Piazza, Greyhawk super-fan ripvanwormer has created some cool maps based on a multitude of D&D references. Rip got his inspiration from Havard's map of the Plane of Fire for Mystara. This is an incredibly cool idea that I wish I had thought of first. The Oerth Plane of Fire is similarly a place where the inner plane mirrors the world it touches on in a twisted way. It uses the same Flanaess/Eastern Oerik landmass but the locations of this fiery world correspond to places linked to the regular World of Greyhawk in canon such as Tovag Baragu. Most however are reflections like the Land of Black Ice becoming the Land of Black Flame. I love it. The latest variation of these inner plane maps is the Plane of Shadow a world cast by the shadow of Oerth according to ripvanwormer. Places like the Dim Forest, the Valley of the Mage and Carahast's Caves of Sleep have obvious connections to the shadow realm. All three of these maps are an amazing work, please check them out, and keep an eye out for more I'm sure!